Actually, let's just cut to the chase. 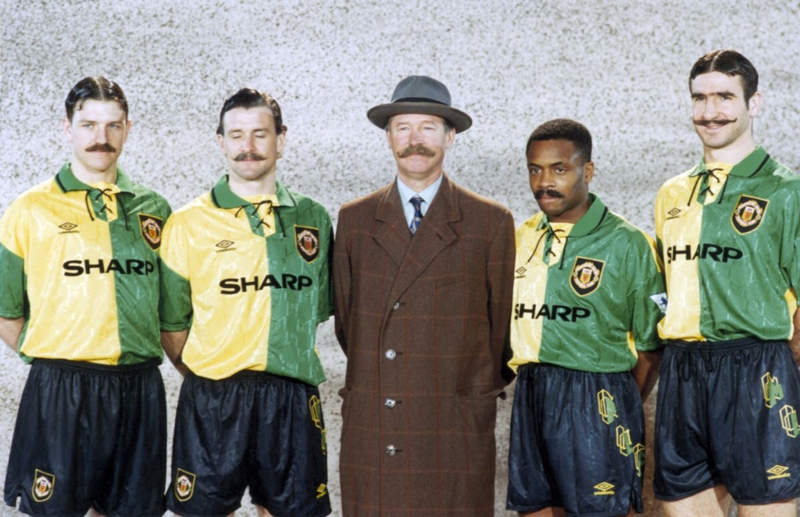 The legend goes that Man United's forebear, the Newton Heath (Lancashire & Yorkshire Railway) Cricket & Football Club, were presented with cashmere shirts in green and gold in their second season in existence. 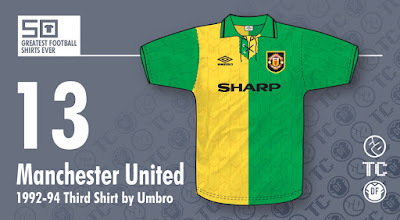 In fact, reports of such an item existing are scarce, and it may be not beyond the realms of possibility that until Umbro came up with this supposedly retrospective design to add to their new United Home and blue Away shirts, neither the Red Devils nor their progenitor ever wore green and yellow/gold halves. But no one knew that in the early 1990s, we have to believe, and black and white photographs from one hundred odd years previous, along with isolated reports, somehow suggested this palette - the colours of the L&YR - though there is far more evidence for the wearing of a suspiciously similar outfit in red and white in subsequent seasons. So along came this ostensibly historically sensitive shirt, complete with the lace-up collar seen on the Home version and complex jacquard watermark, dispensing with the alternate-coloured sleeves and embellished with tasteful black trim, not to mention unveiled in hilarious fashion - with Eric Cantona stealing the show not for the last time. And it was brilliant. The connotations worked fantastically - we doffed our caps, 1879 style - whilst the adding of more modern stylings - that watermark, the Umbro logo, the sponsor - seemed to act as the anachronism's membership card to the present, like The Terminator's clothes, boots and motorcycle. Truly, has a footballer ever looked sexier than when Andrei Kanchelskis digested his expulsion from the 1994 League Cup final whilst wearing this shirt, long-sleeved and untucked? 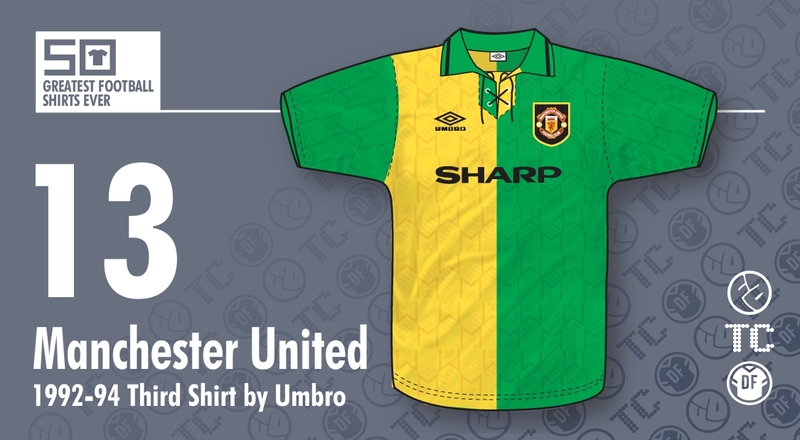 It may be that revisionism was at play to provide us with this masterpiece - or maybe it's at play in this article - but the colours have since, entirely owing to this release, been adopted by the anti-Glazer factions amongst United's current support. Consequently, a whole mini-industry of green and gold wares exists with a raison d'être of protestation, due not to the origins of the club - oh, you poor innocent - but to the unashamed glorious commercialising of said origins in 1992. And you can buy a retro Newton Heath shirt - some have the colours flipped, layering confusion on confusion - but the root of the green and gold phenomenon may be found late in the last century. We'll never really know, and perhaps Umbro have created an alternate, paradoxical backstory to one of the world's biggest clubs. Perhaps. What is certain is that Umbro created a wonderful shirt that becomes rarer and exponentially more valuable as time passes. Those rail workers wouldn't want it any other way.